Parkinson disease is a Neuro disorder that occurs in men and women due to a lack of dopamine in the brain. Struggling with a disease which is progressive and very much visible to the society can be vulnerable at times. It is also quite difficult to see your loved one face problems which go severe with every passing day.As a parent, relative, friend or caregiver of the patient, there’s a lot, which can be done apart from providing them with medical checkups and medications. You must understand the sensitivity of the issue and handle it with care.This blog helps caregivers of the patients with tips and tricks to aid a Parkinson diseased person. The blog directly or indirectly contributes to fighting with the problem together, eventually helping the person to recover from the faced problems. Parkinson patients face problems in swallowing food, planning a diet for the patient can serve as a form of help for them. It may not be to a sufficient extent as the actual nutrients play a major role in physical consistency. That being said, there’s an interesting fact about the apples associated with Parkinson. Apples, especially the red ones are said to contain a certain flavonoid which protects brain cells and hence they serve great to fight against Parkinson. The person suffering from Parkinson disease also encounter respiratory infection. This happens due to the aspiration of food and fluids which possibly leads to malnutrition and pneumonia. Since urinary tract infections are a result of inadequate food consumption and urinary retention, maintaining a diet can actually help the Parkinson affected a person in many ways. It can even help fight constipation-like problems which occur due to lack of digestive foods and fluids. Include juices and milkshakes in the diet. Keep the fluids thicker than usual. Not-so-solid foods such as pudding or fruits that hold water can be a great help. You must ensure that you include soft and moist foods. You must avoid the food which can get stuck in the throat or are difficult to swallow. There’s not much you can contribute to fighting against tremors encountered due to Parkinson disease. However, you can at least try to the following things which may indirectly help lower the impact or prevent additional problems in the tremors. Reduce the consumption of caffeine or foods and fluids that involve caffeine. A rigid brace over the joint and then placing some weight can contribute to preventing tremor problems in the patients. An evident symptom of Parkinson, drooling occurs due to involuntary muscle control. Foods, which stimulate saliva can encourage drooling and hence foods with more sugar should be avoided. As a caregiver, you should encourage the patient to keep his/her lips closed and open only when they eat or speak. Certain lip exercise can contribute to strengthening the muscles in the lips. A Parkinson patient is generally more prone to injuries as they lack physical instability and hence they keep losing their balance or falling down. You can help the patient prevent falls and injuries if you give them walker or cane. Avoid keeping the sharp devices and handholds in the home where the patient prances. You can constantly have a check on such devices and conduct a safety inspection. Try keeping the floor barrier-free so that the patient can walk freely. You can give the patient a pair of shoes which fit them properly. Facing problems while communicating with other people is a common problem among Parkinson patients. This specifically occurs when the muscle control of the patients becomes weak, or when the body doesn’t react to the medication to that extent. Since they struggle while sharing their feelings, they can produce internal frustration. Whenever speaking to them, speak slowly. Encourage short sentences. Try to be a little sensitive, soft and patient toward the person who is struggling with Parkinson disease. You should give your patient some time to respond. You can consider showing them different gestures so that they feel you are engaged in the conversation. You can observe the conversation between you and the patient and make efforts on how you can improve it. You can consult a speech pathologist and ask him to review and assess the observations. Since the disease has symptoms which are very much obvious and invasive, it can affect the patient mentally in a severe manner, leading him/her to depression. There are medications available to deal with such kind of depression, however, as a caretaker, you can always give your efforts to bring to positive vibes from your end. You can help them exercise as it can help uplift their spirit and contribute to improving control of their body. You can consult a PT or OT and ask them how the muscles can be kept limber and bring down the symptoms of Parkinson. Try to calm your patient down and surround themselves with the things which they like and truly enjoy. Involve in activities and groups which support Parkinson patients to heal from the disease. You can ask their parents and friends to get involved in the betterment of the situation. Medication for a Parkinson patient is another vital job for the caregiver. The Parkinson patient should take medicines specific time as per the doctor’s instruction. For example, the Parkinson patient should take some medicine only a certain amount of time after eating. Some very important aspects of medication intakes should be highlighted like it is always advisable to take SYNDOPA (Levodopa) tablets approx… 30 minutes before taking food. One of the most common mistakes made by many Parkinson patients is taking Syndopa tablets after taking food, which according to best Neurosurgeon Dr Paresh Doshi is not correct and should be taken half an hours before taking food for the best results of Parkinson symptom control. So, Parkinson’s caregiver needs to understand the medication’s timetable and make charts to manage Parkinson’s symptoms. As a caregiver, you should fit physically and emotionally. You take time for your care and ask other family members and friends to help out. Being a caregiver, if you are fit and healthy, then you will get better clarity and makes certain decisions easy with well thought. A caregiver should surely with themselves that the time you take off is well spent without tension and stress, you are fully recharged mentally and physically. This write-up was contributed to Credihealth by Dr. Paresh Doshi, Director of Neurosurgery at the Jaslok Hospital and Research Centre. Dr. Paresh Doshi is Paresh Kishorchandra Doshi, M.S., M.Ch. is a leading neurosurgeon and a pioneer of stereotactic and functional neurological surgery in India. 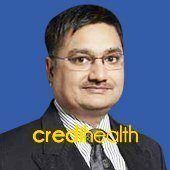 Dr. Doshi is also the Director of Neurosurgery at the Jaslok Hospital and Research Centre. The first DBS surgery for Parkinson’s disease by an Indian Neurosurgeon in 1998. He has conducted over 650 Stereotactic surgeries including 450 deep brain stimulation (DBS) surgeries. He has been credited with several firsts in India.